Based on an unbridled passion, the beautiful Rebecca Hidalgo managed to create for herself a life that was dramatically different from that of her childhood. Now, when the right moment to enjoy what she has accomplished has arrived, she faces a series of inexplicable events that slowly, yet surely, get her into an inescapable labyrinth. Every new step seems to entangle Rebecca with an absurd and terrifying rope that would end up shattering her deepest foundations. Witchcraft and denial converge in this highly psychological, vertiginous novel, a mirror where unresolved anguish of modern life unsuccessfully fights to not be reflected. Readers will find in this first, hallucinatory and challenging novel by Martha Cecilia Rivera, the strength of impeccable writing while holding their breath through the end with eyes that look around for an unknown presence…. This book was really hard to find anywhere on the internet. I managed to find it on Amazon but other than that it's like it doesn't exist or something, which I found very odd. It's odd that such a good book isn't all over the web. I'm not going to say much in my review for this because I don't want to spoil anything for anyone. 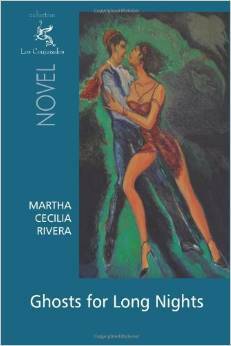 I was captivated from the first chapter, Martha Rivera has an interesting style of writing that was really fun to read. I felt like I was there with Rebecca in this fantasy world she created. I myself live more in my head than in reality so I guess I felt like I related to her in that aspect. But my imagination isn't quite so...magical? Yeah I'll go with that. I loved the way things were described. Not too much into the details but not too little. Some were in as few as one word and honestly those were the best descriptions of them all. Martha Cecilia Rivera did an amazing job with this book. It managed to hold my attention throughout the entire book, which is considered an accomplishment to me. There are VERY few books that I can say I didn't get bored with at all– stupid ADD. I enjoyed the characters and the fantasy aspect of Ghosts for Long Nights.